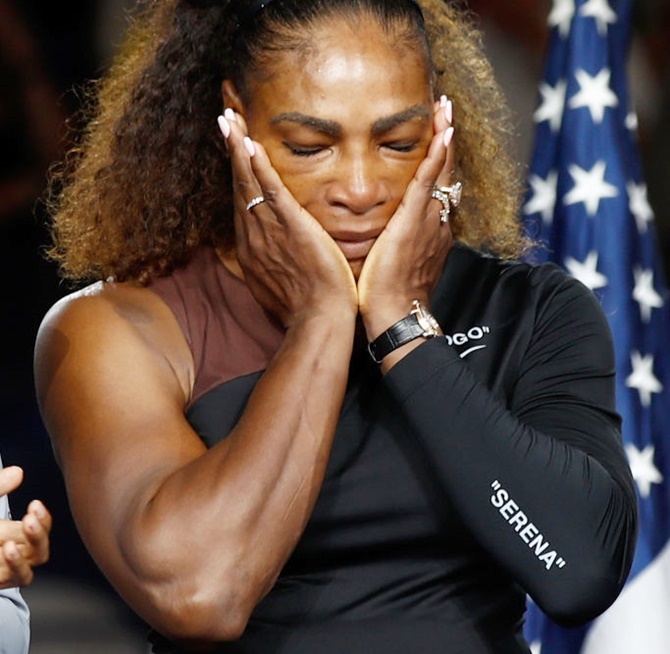 Rediff.com » Sports » Have you seen Serena's 'racist and sexist' cartoon? Harry Potter author J K Rowling has joined several celebrities in criticising an Australian cartoonist for his "racist and sexist" caricature of tennis superstar Serena Williams at the US Open. 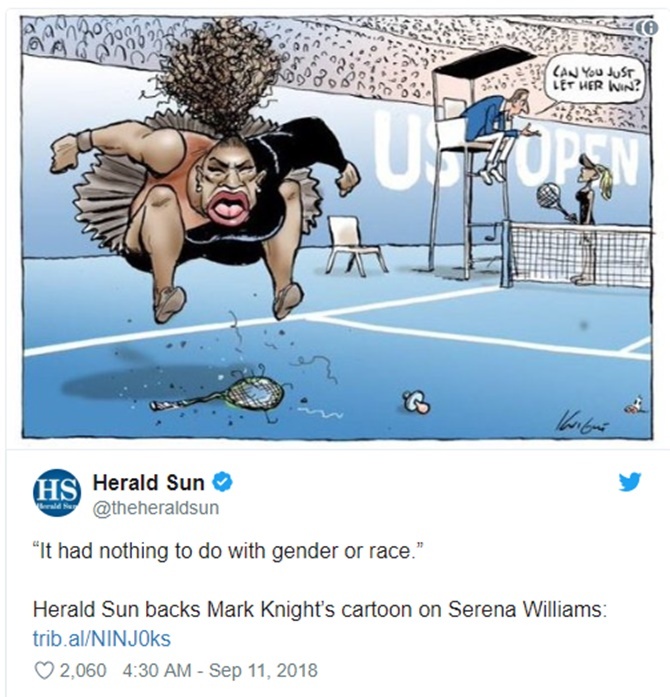 Mark Knight's cartoon, which appeared in Australian newspaper Herald Sun (external link), depicted the 23-time Grand Slam champion stomping on her smashed racket as a dummy lay on the court after she lost the final to her Japanese opponent Naomi Osaka. Osaka is pictured as white and blonde despite her Japanese and Haitian heritage. The 20-year-old is seen reasoning politely with the umpire Carlos Ramos who asks, "can you just let her win?" "Well done on reducing one of the greatest sportswomen alive to racist and sexist tropes and turning a second great sportswoman into a faceless prop," Rowling tweeted on Monday. The cartoon has been blasted by numerous athletes, celebrities, journalists and activists. The National Association of Black Journalists said the cartoon was 'repugnant' on many levels. "The September 10 cartoon not only exudes racist, sexist caricatures of both women, but Williams' depiction is unnecessarily sambo-like," it said. Bernice King, the chief executive of the King Center and daughter of Martin Luther King Jr, said the newspaper's stance was 'unfortunate'. Speaking on ABC News, Knight defended the cartoon, saying "I'm upset that people are offended, but I'm not going to take the cartoon down". In 2015, Rowling had slammed a troll who claimed that the only reason Williams was successful was because "she is built like a man". "Yeah, my husband looks just like this in a dress. You're an idiot," she had tweeted alongside two pictures of Williams. During Saturday's final, Williams smashed her racquet and called chair umpire Ramos a 'thief' and a 'liar'. She was later fined $ 17,000, stirring the tennis world and triggering a broader debate about double standards towards men and women in the sport.